Nestled in the tiny hamlet of Mautby with views of rolling Norfolk countryside, just two miles from sandy beaches & bordering the waterways of the Norfolk Broads, Lower Wood Farm is the perfect setting for a family holiday. Its eight luxury holiday cottages offer the highest quality fittings and furnishings and are tastefully designed with impressive attention to detail, many retaining the old beams and vaulted ceilings. All have been awarded Visit Britain 4 and 5 star ratings and sit in five acres of beautiful open gardens and fields with an abundance of wildlife. At family run Lower Wood Farm, every need of a young family on a self-catering get-away-from-it-all break is considered. Its latest addition, the Gold Award 5 star rated Cape Cottage, is specially designed to be all accessible for wheelchair users. 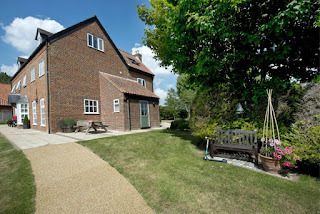 Lower Wood Farm’s superb indoor heated pool and the play barn are in keeping with the rural farm buildings and its safe outdoor grass play paddock complete the ingredients for a perfect family self catering cottage holiday in Norfolk.